Please keep praying for Nicaragua. The unrest continues as the country is trying to move forward after the violent crackdown by the government on protests led to dozens of deaths. 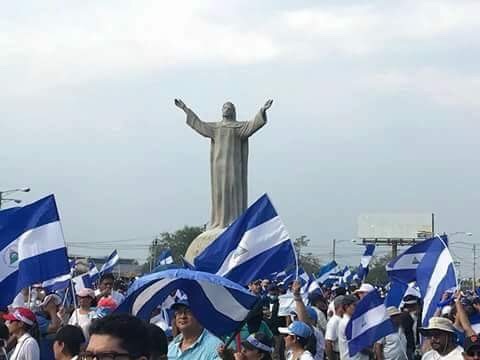 We believe that God can do miracles and we are asking for peace, justice and truth in Nicaragua…Peaceful non violent changes, justice for the families who had loved ones killed, and truth to be told about the atrocities. The above picture captures the situation well. Here are seven university students who marched in a small group last week hoping to arrive at the National Assembly building to protest the oppressive actions and deaths of over 30 of their fellow University students. They were blocked by hundreds of riot police in full gear (there is another line of riot police further down the road out of view of the picture). It is the perfect example of the excessive tactics being used to stop civil protests. Interestingly one of the giant pictures of President and Vice President lingers in the background. In general the last week has been calm and non violent. The people have continued to march and protest as the country tries to organize a National Dialogue for peace. 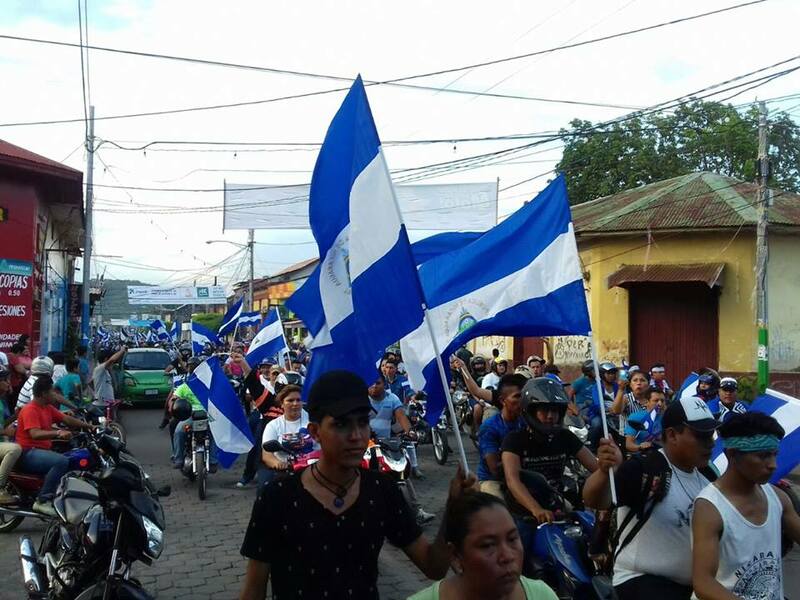 President Daniel Ortega has called for the dialogue. The people are having a hard time embracing dialogue when there has been no justice for the dozens killed. The Catholic Church has shown incredible leadership in trying to mediate and initiate peaceful change in the country through the dialogue. Unfortunately, last night the Police clashed with protesters in the town of Masaya. There had been three straight days of peaceful marches and motorcycle caravans in the town. They were growing in size. Things turned violent quickly as rocks were thrown and the police responded with tear gas and rubber bullets. The reports are only coming out today, but it is tense in that town. So please keep praying for Nicaragua! Peace, Justice and Truth. Personally, our family is doing fine and we are continuing our ministry work at Club Esperanza, the rescue homes, Ruby Ranch, hosting teams that come to help and living our daily life of home schooling our kiddos and the normal things. We are keeping our eye on the news and I probably visit facebook pages dozens of times a day just to keep up on the news. We also continue to pray. Today is Monday and we fast on Mondays as a ministry. We are focusing these days of prayer and fasting on the continued unrest here…please join us if you can. Keep praying for Peace, Justice and Truth. Peaceful changes can happen…Lord we ask for that in Jesus’ name! 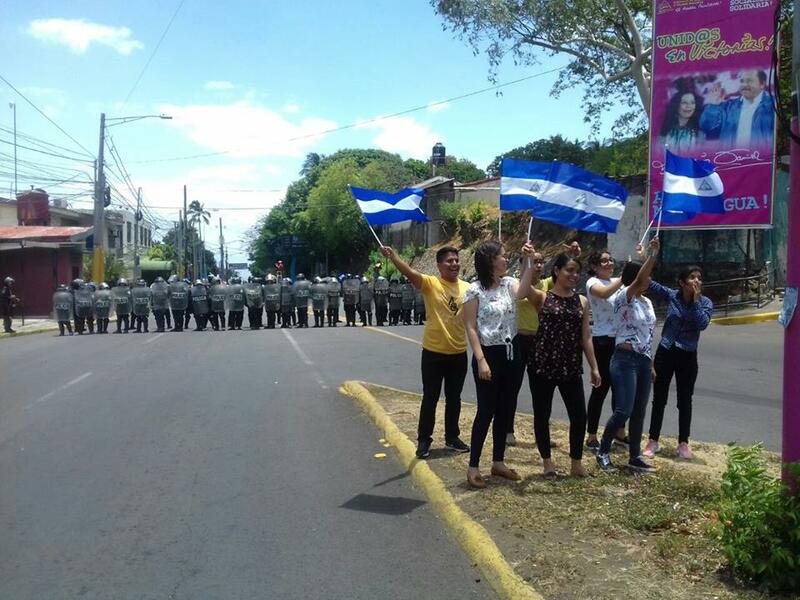 This past week the unrest has continued in Nicaragua. The photo above is beautiful, it is from the March last Wednesday. We continue to pray for Nicaragua and ask Jesus to bring Peace, Justice and Truth. We believe that God can do miracles and end this conflict without any more violence. Please specifically pray for that today. You can see from the video above that last week on Wednesday their was a huge peaceful march that occupied entire city blocks in downtown Managua. It was pretty incredible to see and Praise the Lord it was peaceful. It was really something incredible. We are praying this week brings some resolve and things can change in Nicaragua peacefully with no more violence. Thank you for praying with us! Our families are doing well and our ministry sites are still operating. We had to close school early a couple days last week at Club Esperanza, and today we are canceling classes waiting to see what happens with the National Dialogue. This past week we also had a team in town with The Ohran family who moved to Nicaragua last year to work with Ruby Ranch. They worked all week at Ruby Ranch and were a big blessing there! We are chugging along in the midst of things and just taking extra precautions to avoid protests. We appreciate all of your prayers for our families and the friends we work with here! The video link below is very informative and up to date…. The last three weeks have continued in unrest here in Nicaragua. We have had a national dialogue attended by President Ortega, the arrival of the International Human Rights Commission, pressure from rural farmers via road blocks, pressure from the Organization of American States, pressure from the White House and U.S. Politicians in Miami like Ileana Ros-Lehtinen and Marco Rubio, most recently a visit by Amnesty International headed by Bianca Jagger who is Nicaraguan (former spouse of Mic Jagger), and most vocally there have been continued protests in the streets. The violence has not stopped however. Yesterday was Mother’s Day and in Nicaragua and it is one of the biggest holidays of the year. In spite of the “machismo” reputation Nicaragua is a very Matriarchal culture. But this year Mother’s Day fell on a day when the entire nation was grieving. The incredibly huge march you see in the video above, is nearly an entire nation coming out to march with the “Madres 19 de Abril”. This is the group of mothers who have lost children since April 19th. Even as the 100s of thousands marched, there was violence. On the day that was supposed to be about grieving the loss of life over the last month, there was more death. Please keep praying for Nicaragua. We need a miracle to happen in the hearts of those in power to change the future here. ← Political Unrest…Please Pray for Nicaragua.